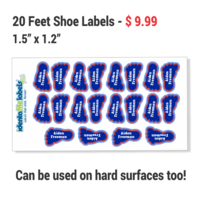 Feet Shoe Labels - 1.5" x 1.2"
Our cutest stick on name labels for shoes. Our shoe name labels are backed with a wicked sticky adhesive so you can stick these to all your family's footwear and anything with a hard surface. Stick on insole of shoes. Laminated so they'll take a beating and still look like new. Our Feet Shoe Labels are backed with an industrial strength adhesive so they'll always stay stuck to your family's footwear. Our shoe name labels are waterproof so you can throw dirty footwear in the laundry and rest assured the labels will still stay stuck. For best results, stick your shoe labels on the insoles of your shoes. 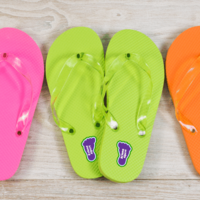 Use our simple design center to create your custom name labels for shoes today! 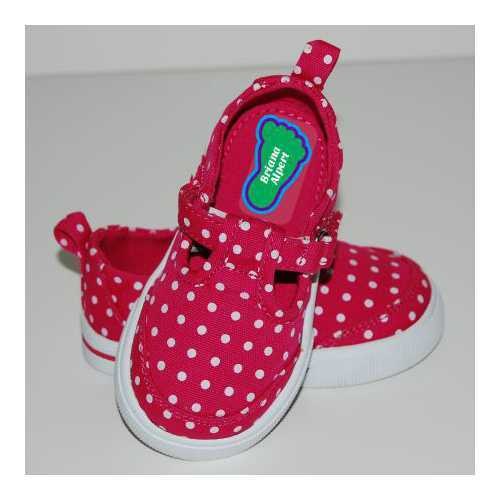 Product Safety Information Your Feet Shoe Labels SHOULD BE APPLIED BY AN ADULT or WITH ADULT SUPERVISION. All of our labels are made with non-toxic materials and eco-solvent inks. Our labels are super sticky and durable but they're not truly permanent. They're made to come off with intent. Continued picking or chewing can make a label come loose from clothing and other materials. Keep an eye on the labeled items if they're going to be used by young children to make sure that they stay intact and are not accidently ingested. be especially careful when labels are used on teething rings, pacifiers, blankets etc. Our Barefeet Waterproof Shoe Labels are laundry and dishwasher safe. 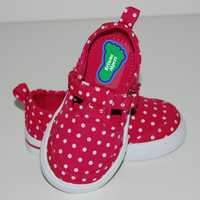 Stick your labels to the insole of your shoes, (where the bottom of the heel sits in the shoe). 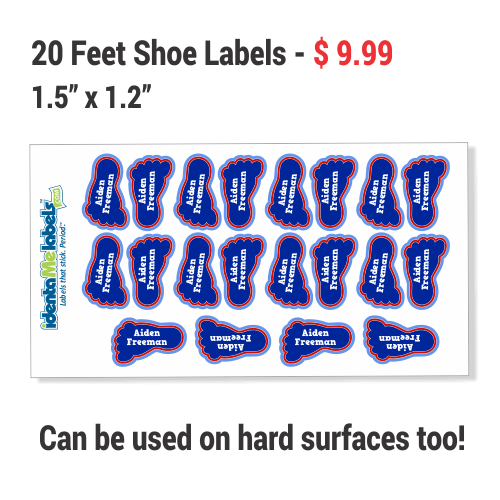 These shoe labels will also stick to any hard surfaces - so you can use them on just about everything!